Drama therapy is an embodies therapeutic method that incorporates role-play, storytelling, dramatic projection and other creative arts modalities that invite personal and inter-personal exploration and reflection, empathy & communication development, self-awareness, and expression. 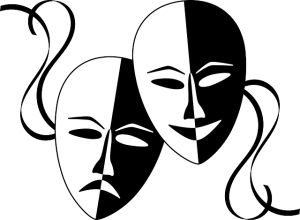 Drama therapy invites personal growth, self-awareness and spontaneity, through a creative process. Although the therapists may plan each session based on a theme, they are trained to deal effectively with emotions or conflict that might arise during the session. These situations provide meaningful opportunities for growth & skills development. Through role-play, role reversal, improvisation and other drama-based processes that provide rehearsals-for-living, you will have many opportunities to learn and practice social-emotional integration and reflect on past behaviours or experiences. Projective techniques are a key feature of drama therapy. It is a distanced approach that allows people to project onto an inanimate object, or fictionalized character, feelings, thoughts, fears and wishes. It is often easier to create a fictional character to explore unexpressed feelings than it is to express this on your own. Drama therapists may also integrate other creative arts modalities as a tool for projection. For example, the therapist may ask you to write a story or a letter, invent a fictional character and give the character a voice or pretend to become that character. Each character might interact with the therapist through scene work and role-play. The safety of working through projective techniques are aimed to free you from the negative images you hold of yourself, and opens you up to new ways of being perceived. Through the embodiment of character and role-play, clients gain a new experience of themselves in the here and now. Unlike talk-therapy, drama therapy engages the client through all their senses, as well as through the body – kinesthetically. This visceral experience is internalized. Drama therapy is especially helpful for articulating thoughts and feelings, as clients can act out emotions that have been unexpressed. For people, who may have difficulty with self-reflection and making the connection of the what is discovered in therapy to their own lives, the experience in the drama therapy enables them to practice interacting and reacting in different ways. In drama therapy, acquiring knowledge is a lived experience.